penny d jones set out with the idea of creating a kitchen – y gegin gelf – which then developed (in discussion with one of the artists) into the idea of y gegin fach which is a traditional Welsh kitchen, which is actually a seperate building outside the house – very much in existence on farms. The idea was to deliver daily workshops (12 to 3 every day) in Welsh to raise the profile of Welsh in Haverfordwest, though traditionally a non Welsh speaking area it is increasingly present in the town with a Welsh junior school, a secondary school to be built and Welsh taught in all the schools in Haverfordwest. There is a Welsh newspaper, Dan y Landsker, Welsh is taught to adults and there is a Welsh department in the Pembrokeshire college and in Pembrokeshire County Council, there are also a number of conversational groups, a Merched y Wawr and a Clwb Gwawr in Haverfordwest. The idea was to deliver the workshops in Welsh so that it was easier for Welsh learners wo learn whilst doing something practical – even non Welsh speakers could learn a word or two. The kitchen idea was to make it more accessible to all – hoping to engage older people and people not interested in art. penny found artists to lead each session, some were people she knew and others through Pembrokeshire College: Sadia Balfour and Maia Aram, both from North Pembrokeshire; one artist from St David’s area, Sarah Williams; two artists from Newport area, Gemma Green-Hope and Rose Seymour; one artist originally from Crymych but now living in Laugharne, Glesni Teleri Thomas; and one artist living between Cardiff and Drefach Felindre, Roger Lougher. 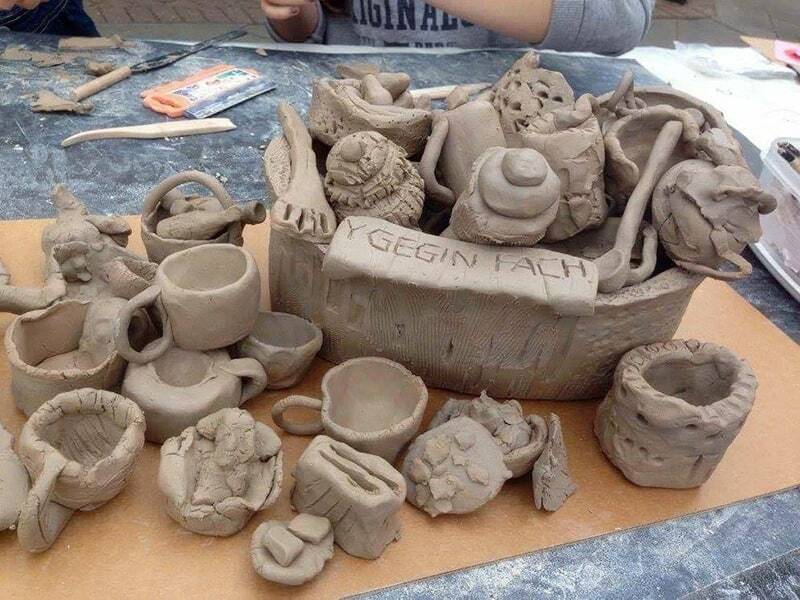 From drawing and painting to writing, animation, printmaking, ceramics and painting with icing the artists all worked with the passing public to create the kitchen (Y Gegin Fach). The project was publicised through an advert in Clebran (local Welsh speaking newspaper in North Pembs) an article in Llien Gwyn (Welsh speaking paper in Fishguard area) and all the information was sent to Dan y Landsker (Welsh speaking paper in Haverfordwest and South Pembs) but unfortunately there was no issue for July and it was too late for the June issue. penny also sent bilingual leaflets for each child from Ysgol Glan Cleddau, Fenton and Prendegast schools. The project was successful in that Y Gegin Fach was created. At least 144 people took part during the week. A lot of the children spoke Welsh and a few adults participated but mainly just the parents of the children. There were a number of holiday makers, those from South East Wales (eg Cardiff) spoke Welsh but visitors from England did not. Some adult Welsh speakers were delighted to find a Welsh speaking project but reluctant to actually make art! Feedback from the artists was that they all enjoyed it and would welcome a similar opportunity. The only negative comment was the need to give the children something to take away rather than leave it in the kitchen. One artist found a solution to this by each child creating two pieces, one to take home and one to stay. Another suggestion was to take photos of the work and send it by email. One artist thought it could improve with a larger shed. Some people said it would be great to have the sheds in other areas such as Fishguard, St David’s. Tenby and Narberth. The extent to which the artists enjoyed it, one said it was like running a workshop in the Eisteddfod, was tantamount to its success.